In our attempt to find the source of the VM Zodiac figures, we will now have a look at another set of Lauber’s manuscripts. In this post, I will argue that Diebold Lauber’s Buch der Natur offers further evidence of some relation between the Alsatian workshops and the VM Zodiac figures. what I’ve said for more than a decade is that the Voynich’s zodiac roundel drawings appear to me to have been copied (albeit fairly ineptly) en masse from a single (probably German) calendar of the late fourteenth or early fifteenth century. Nick has been early to notice that the Zodiac figures are somewhat different than the other human figures in the manuscript. In my own research as well, they always surfaced as the odd ones out. Hence, it is very, very likely that they were copied from a different source than whatever the rest of the VM is. As Nick says, we’re likely looking for a source a few decades before or after 1400. I don’t think it has to be a calendar, but it certainly could be. The manuscripts contain Konrad von Megenberg’s most popular work “Buch der Natur” (1349) which was still widely read two centuries after its completion. Three copies were made in Lauber’s Haguenau workshop, all around 1440. I have not been able to find any images of the Stuttgart manuscript, the other two are digitized entirely. In a 2016 post, J.K. Petersen already noted similarities between the Heidelberg manuscript and the VM. To this, I would like to add two observations from the Frankfurt Buch der Natur. They will reveal that Lauber had access to images very similar to the VM bull and crayfish. The bull might be the least spectacular, but still it adds to the pile of evidence. It was found on this page which chronicles an apparent shouting contest between two rows of confused animals. Note the overall curves, long, lyre-shaped horns, the tilt of the head. Especially the ridiculously slender neck and the un-bull-like way it stands on the body. Now, most of these properties are found in some other manuscripts. But Lauber’s bull is about as close as you will get. And here’s the main course. One thing JKP has often noted about the VM lobsters/crayfish is that their legs are erroneously placed on the tail instead of on the body. Even though Voynich researchers have scoured hundreds (thousands?) of Zodiacs and related images, no parallels for this quirk have been found. Even manuscripts with rather frivolous crayfish, like the below Munich Clm 59, always put the legs on the right part of the body. So despite years of vigilance, even JKP – who pointed out this detail, has not found a convincing parallel; it doesn’t exist. So there’s only one conclusion right? It’s an error by the VM artist. He miscopied from an example or simply drew from memory without knowing where the legs were supposed to go. It’s some kind of lake full of large, blue fish. But what’s that in the top left corner? Let’s zoom in. I’m not sure. Nick may be right to resolutely posit a source (or source group) common to Lauber and the VM. Kind of like the biblical Q source. We might call this hypothetical document QVL (Quelle Voynich-Lauber). Based on the commonalities between Lauber’s stock and the VM Zodiac, we can reconstruct what QVL almost certainly contains (if it still exists). Throughout this series of posts I’ve also been pointing at stylistic similarities between Haguenau works and the VM in general. This is something JKP noted as well in his 2016 post. Whether this means QVL must be a Lauber or pre-Lauber work, as Nick believes, I don’t know. Previous Previous post: Gemini: type, Alsace or Willehalm? To be precise, I think we’re not yet in a position to worry about whether the source document (if it does indeed exist) is Lauber, pre-Lauber, or post-Lauber. The important thing is to continue what you’re doing here, i.e. following the historical logic through to the end. I think that calendar, in the best case, is a thoroughly “fixed” version of what we’re looking for. What did stand out to me immediately when I first came across it is the fact that the Ram is trying to eat tree leaves. By the way, might it be worth trying to get a look at the remaining Lauber Buch der Natur? I wasn’t able to find a single image online. One nice thing about Voynich studies is that different people have access to (or just know about) different image databases and secondary sources. For example, a good image source (though sadly not for Konrad von Megenburg) is often the Warburg photographic database, albeit searching it can be a PITA. Also: the Stuttgart MS has an extensive secondary literature (according to its Handschriftencensus entry), some of which may well have scans of the ms. The crayfish is indeed a superb find!! Koen: have you also noticed with the Voynich Taurus drawings how they have a paltry scrap of green grass beneath the bull, which is more or less exactly how Lauber’s illustrators did their thing most of the time? Yeah, there are lots of similarities, also artistic ones. For example how human figures in the Haguenau MSS are often a bold outline with some stuff added in afterwards, just like the in VM. And look at the way the breasts are drawn on the female Gemini from McKell calendar. Institut der Universität Tübingen (Masch.). Tübingen 1993. Two bulls actually, a wild “rind” (aurochs?) and an ox. There’s a wild and tame goat as well. Also a lion with wonky eyes and a pointy tongue. It would be quite a treat if Lauber’s remaining “Buch” was based on such templates. There’s also a frog being eaten by a heron (? ), which is not too far from the frog in the Voynich Pharma section, as I recall. In this, the author clearly suggests that for the Frankfurter issue that is quoted in this blog post, the artist must have drawn from several sources. She refers both to bestiaria and heraldic sources. Looking at the lion in the illustration at the top of this blog post, I think we have an example of the latter. It is also very clear that this lion is from a very different source than the Voynich lion (despite the wobbly eyes). Therefore, I am still extremely skeptical about finding a single source for the Voynich MS zodiac. If there is one, Lauber certainly did not use all of it. Rene: for me, the first (and most direct) question is whether Lauber’s workshop *itself* produced an illustrated calendar containing the specific drawings *that were then ineptly copied into the Voynich zodiac roundels*. This is the simplest and most straightforward of all the available hypotheses, and (I think) needs to be addressed before all others. That is, I think the historical logic problems you are running into arise not from the visual evidence, but from (what appears to be) your assumption that the Voynich drawings and Lauber illustrations can only have come from a (pre-Lauber) predecessor work: when in fact the thing that Koen is teasing out from these works is that what we are seeing are Lauber illustrator motifs. It’s true that the three copies of the Buch der Natur date to around 1440, which is at the top end of the radiocarbon dating for the derivative work (the Voynich MS). But you also know full well that what radiocarbon dating gains in scientific precision it can often lose in historical accuracy: and in the end, the core historical logic should have primacy. The way I look at it is this: what do we know, and what are the possible explanations? What we know (with rare certainty for Voynich standards) is this: Lauber uses images very closely related to the VM Zodiac. Additionally, we can derive from this that the VM Zodiac images are copied. We can also derive certain things about the source from which the VM was copied, for example that the man is wearing a green round hat and that the lobster is fundamentally flawed. Now for *how* these images came to be both in Lauber’s stock and the VM Zodiac is another question. My money is on common ancestry, but I think all avenues remain open at this point. Anyway, I mailed ms Spyra yesterday, hopefully she’ll know something. I’m also considering contacting Lieselotte Saurma since she literally wrote the book on Lauber. Are you planning to buy Spyra’s book? If not, I’ll buy myself a copy. Don’t forget causality: if the twins were adapted from a wedding pose, the wedding pose *came first*. The composition of the Taurus bull roundel strongly suggests it came from a Lauber drawing, etc. There’s more than just the radio-carbon dating that makes a post-1460 date less likely, but it isn’t really about that. The online parts of Spyra’s book (which is quite a large part) contains a lot of highly relevant information about the illustrations, some of which are clearly derived from the textual descriptions, while others (including the lobster) are clearly not following the text, but must have been copied from examples – most probably from other illustrated manuscripts. (For me, this is generally of great interest for understanding the Voynich MS illustrations). The Frankfurt MS has a lobster which is drawn by someone with artistic skills, yet with the legs in the wrong place, *and* the wrong number of legs. The Voynich lobsters show no artistic quality, also have the legs in the wrong place, but they have the right number of legs. All of this has to be explained by the hypothetical source(s) for the Voynich MS zodiac. I agree that there is hardly any doubt that one or more sources was/were used, and a ‘courtly love’ source for Gemini is also a very useful new piece of information to be added to the list. I have not yet seen anything that would help to decide whether the Voynich MS should post-date any product of the Lauber workshop, i.e. there is no evidence. This seems to be more a matter of opinion. I agree with your view on the situation, Rene, though I would certainly also add that Lauber’s “courtly couple” is related to the VM Gemini. There are two reasons why I think a direct Lauber-to-VM transmission is unlikely based on the evidence we have now. 1. The French image Marco shared confirms once again that true crossed arms were a valid type, and the VM adhered to it even though it’s difficult to draw. Lauber uncrossed the arms. There is no way the VM would re-cross the arms based on a Lauber example. 2. Looking at the man’s clothing, Lauber uses an enhanced version. While studio 1418 and the VM use a simple green tunic with a “wavy” bottom, Lauber puts a fur coat over this. In the initial post I showed the Arnolfini portrait, to indicate that this might be the result of a change in preferences for wealthy clothing. This would again place the VM somewhere pre-Lauber. On the other hand, everything we can learn about Lauber’s sources is of great value because I am almost certain at least one of those sources is shared with the VM. But that could be a Parisian source or something else for all I know. Rene and Koen: I accept that the crossed arms imagery points away from a direct connection from the Lauber uncrossed arms imagery. And I accept that the Buch der Natur crayfish has the wrong number of legs, thus also pointing away from a direct derivation from that to the Voynich. And so I accept the overall argument that the predecessor document to the Voynich zodiac roundels (and I think there is a high likelihood that it is a single predecessor document) was almost certainly also a predecessor document to both of those. However, where my reading differs is that I see the overwhelmingly probable explanation for everything we see is that the predecessor document was also made by the Lauber workshop: and it was most likely an astronomical or medical calendar, like the McKell manuscript. Now, this is nowhere close to the 1460 figure Rene just threw in: but I would be surprised if it was much before 1440. But this is all historical logic we can work with and develop, if we are so minded. Nick: Right, I see what you mean. We also mustn’t forget that Lauber’s shop was preceded by the “Werkstatt von 1418” in Haguenau. The Werkstatt’s style and palette was a bit closer to that of the VM, in some cases even very close. What I’m interested in is the following: where did Lauber get his models? He’s not the kind of guy to invent everything by himself, he must have assembled a stock of example imagery from manuscripts available to him. One of these must have been the manuscript(s) with the unnatural crayfish, a bull like those of the VM and a pair of lovers like the VM Gemini, since all of those appear both in the VM and throughout Lauber’s products. So we really have two movements to trace: proper crossed-arms imagery, which likely originated in France. Marco recently shared an image that’s a perfect staring point: https://www.voynich.ninja/thread-591-post-22190.html#pid22190 . This is what I’d call the forward line of investigation. Secondly, the backward line starting from Lauber and the sources that may have been available to him. And wherever those two cross, there should be our source for the VM Gemini (and likely other Zodiac figures). Koen: it’s not really a matter of what Lauber’s illustrators did or didn’t invent – we already know that they happily copied from previous sources, so there will always be predecessor manuscripts to unearth – as I said previously, Lauber’s workshop’s copying practice will keep Art Historians in work for many years yet. However, the crayfish styling appears nowhere else: and so I think there is a good chance that the predecessor crayfish was original to Lauber. And when I look at the tokenistic ground beneath both Aries, both Taurus, and the Virgo, what I see is the kind of stripped-down layout typical of Lauber’s workshop. This seems to me to support the idea that Lauber’s workshop is where the predecessor document came from. At this point, I’m not trying to convince you that this is the only possible answer: all the same, I don’t believe that anyone currently has any information that sits contrary to this proposed explanation. A copy of the Buch der Natur is in the Library of Congress, whose catalogue notes that its origin lies in Thomas of Cantimpre’s Natura Rerum, placing it within works whose lineage extends through earlier works having similar titles and which link again to those ‘Books of Marvels’ gained from the eastern Mediterranean world, in one of which (as noted years ago) we find a script noticeably akin to the forms used for Voynich script. Given that the person who had the Ms for decades and made strenuous efforts to learn how to read it said it consisted of material gained from the east, this line you have discovered in your research seems worth following futher to its source, I should say. Thanks, Diane! I checked all Buchs der Natur I could find but this one had escaped me. Going through it, I see that it contains similar images to the most relevant Alsatian MSS. I think it is indeed very likely that the Megenberg illustrations as a whole share a (relatively close) ancestor with the VM. Koen – with my ongoing efforts – curiously hampered – to have Voynicheros take methodologies seriously, I’ve mentioned your post (and one of Nick’s) in recommending an article for the library at voynich.ninja. Looking forward to it. How’s your German? Is this: Ulrike Spyra: “Das >>Buch der Natur<< Konrads von Megenberg, die illustrierten Handschriften und Inkunabeln". Böhlau Verlag, 2005? I briefly had access to Gerold Hayer's standard treatise of Megenberg's Buch der Natur, which is frequently mentioned by Spyra. For the questions of interest here, Spyra will have more relevant information, though one point is clear from Hayer: only a small fraction of the copies of the Buch der Natur are illustrated, and the ones from Lauber are among the first. Koen, about the brown bull. The sway-back together with lyre-shaped horns served as definition for the form for me ( the aim being to read the intended reference rather than to trace the draughtsman’s sources). Treating the calendar (some time ago now) I noted an interesting set of ideas implied by the disposition of the doubled creatures and – to jump all the evidence, examples, and implications, there’s a habit of identifying north with good/tame’ and south with bad/undomesticated’. 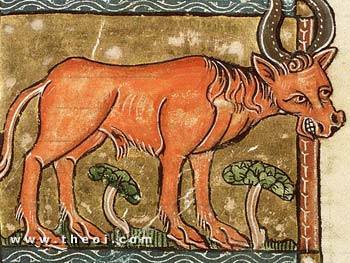 The red bull is of the south/wild sort and to be identified with the bestiaries’ ‘Aethiopian-‘ bull. (In the original analysis I identified the species but ‘Aethiopian will do here. Medieval and earlier sources have Aethiopia’ towards the western, not eastern side of Africa. A good image occurs in a fourteenth-century ms from the Netherlands and that can be seen easily through theoi.com. That ms is dated 1350, though (of course) within the line of transmission which continues back through Cantimpre to the still-earlier ‘Book of Marvels’ genre. Ps – anyone whose name deserves mention as precedent for the ‘Aethiopian’ id – do say though as I’m aware there was no earlier analysis of calendar series. Cheers. Diane, I largely agree though something is still bothering me. Lauber is somewhat late, but compared to the VM source maybe not as late as you’d think. 1) The people who drew the VM images took them from an older source and updated the fashion. Implication: they took some liberties with the source material and were familiar with the international gothic “courtly” style, and thought it would be appropriate to bestow aspects of this style on the figures. It would also mean that the manufacturing of the manuscript can be dated down to a few decades based on images, independently confirming the carbon dating. 2) The figures were copied faithfully. This implies that a source existed or still exists with similar images, and that this source cannot be older than c. 1400 (or c. 1390 if it was a high-end North Italian production). I think that if we accept the results of the fashion investigation, one of these options *must* be correct. But which one it is, has implications for further research. Nick seems to favor the second option; what do you think? I’m happy to discuss the pros and cons by email, but in the space of a blog comment I’d only say that I agree the present form for the calendar-centres may be dated not earlier than 1400 and surely no later than 1438.